Delhi NEET Counselling Schedule MBBS BDS State Quota Admission: Faculty of Medical Sciences, Delhi University has announced official notification Delhi NEET State quota counselling 2018 for MBBS & BDS courses. According to the notification, this year FMSC will not conduct 85% DU NEET State quota counselling. 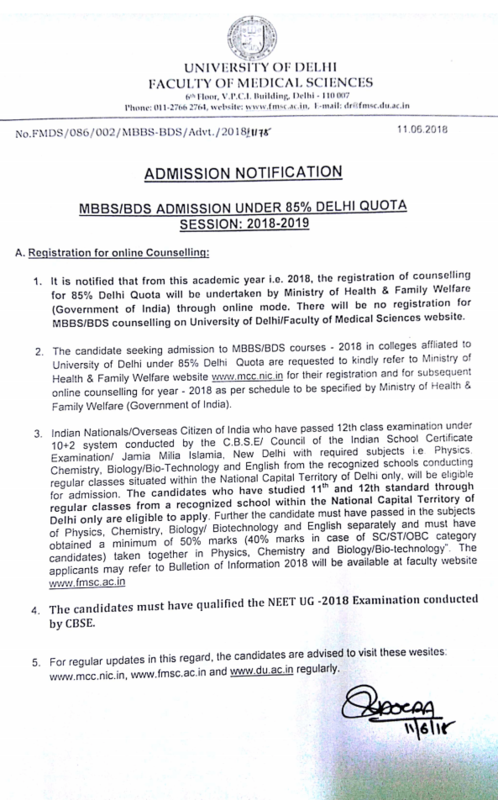 From this year, the registration of 85% Delhi Quota counselling will be conducted by Ministry of Health & Family Welfare (Government of India) through online mode. Eligible candidates can fill the online registration form before the deadline. The Ministry of Health & Family Welfare (Government of India) is organizing the State quota MBBS/BDS Admission 2018 Counselling. According to qualified candidates in NEET 2018 from Delhi, a huge number of applicable candidates will fill the online registration form. 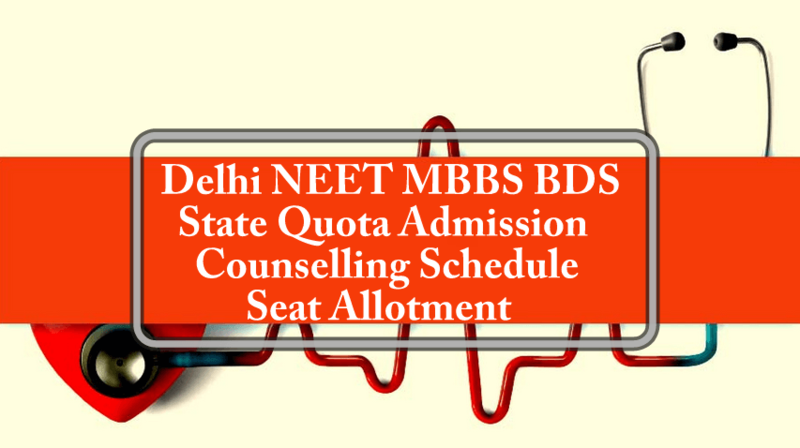 All candidates who have applied for the MBBS/BDS Courses through Delhi NEET Counselling state quota will be able to check merit list on the official website of the Ministry of Health & Family Welfare (Government of India). Candidate must have Indian citizenship and passed 12th class examination under 10+2 system conducted by the CBSE/Council of the Indian School Certificate Examination/Jamia Milia Islamia, New Delhi with necessary subjects i.e. Physics, Chemistry, Biology/ Bio-Technology and English from the recognized schools conducting regular classes situated within the National Capital Territory of Delhi only, will be eligible for admission. The candidate must have studied 11th and 12th classes regularly from a recognized school within the National Capital Territory of Delhi. Further, the candidate must have passed in the subjects of Physics, Chemistry, Biology/ Bio-technology and English separately and must have obtained a minimum of 50% marks (40% marks in case of SC/ST/OBC category candidates) taken together in Physics, Chemistry and Biology/Biotechnology”. Interested female candidates from other states belonging to SC/ST/CW category who have passed the qualifying examination from any Indian Universities/ Board or Foreign Universities/ Boards are eligible for admission to Lady Harding Medical College only against the seats that are reserved for these categories, subject to their fulfilling the given conditions. The counselling schedule will be published by the Government of India, Ministry of Health & Family Welfare, Directorate of General Health Services (DGHS), New Delhi. After the declaration of Counselling Schedule, applied candidates would be called for the counselling in a batch of 10. The counselling would be conducted for MBBS/BDS Courses in a particular College (LHMC/ MAMC/UCMS/MAIDS). The seat allotment result will be published on the official website of Delhi University. Important Note: A candidate shall not be allowed to join MBBS/BDS course if she/he is found medically unfit for the course. Final World: All candidates are suggested to keep visiting this particular page for every single update of Counselling 2018. Soon we will update the counselling Schedule here. Candidates can follow us on Facebook for more discussion and updates. I am a Girl under gereral category delhi quota. My score is 525. can I get delhi college? I have got compartment in maths and passed physics chemistry and biology with English(regular) in 2016 now I will appear for maths compartment in 2017 my school is in Delhi. Am I eligible for NEET Delhi state quota . Reply my question as soon as possible because I have to fill neet 2017 form. Delhi State Quota Counselling is confusing. It was to begin on 25 June. As I know just now the last date of registration at MCC website was 18th June. 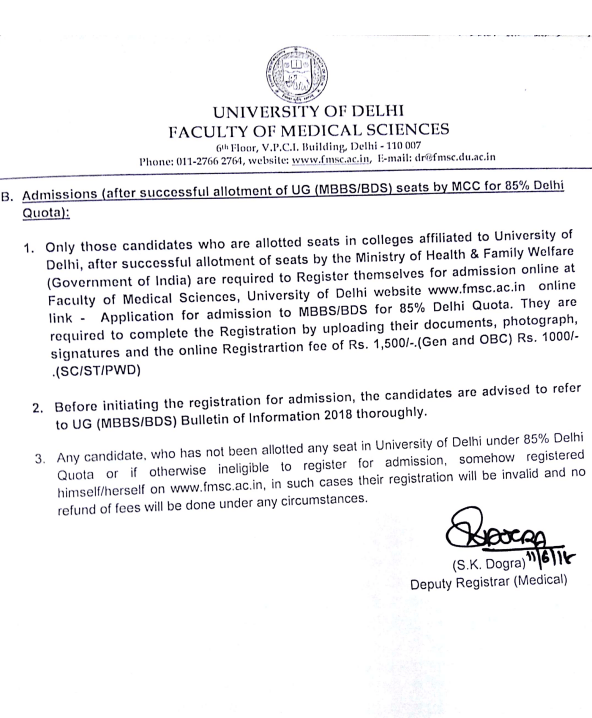 Candidate is registered for All India Quota but perhaps did not check DELHI UNIVERSITY option below. In case he misses first counselling, can he register for second counselling?